This historic Dentzel Carousel was built in 1896 for the 1904 St. Louis World’s Fair and later sold to the City of Meridian in 1909 for $2000. It has occupied the same location in The Highland Park Carousel House since that time. It is the only remaining carousel house built from a Dentzel blueprint. 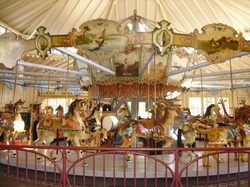 In 1977 Highland Park and the carousel were placed on the National Register of Historic Places. In 1986 the Department of Interior designated the carousel and carousel building as a National Landmark. This honor has been given to only 11 carousels and this is the only one in the south. From 1984 through1995 the carousel underwent a complete restoration and repainting returning it to the original colors. The entire restoration was done by Rosa Ragan of Raleigh, N. C. Restoration of the carousel was $112,000 while the restoration of the carousel building was nearly twice that amount. Directions: From I-20/59 take the 22 Avenue exit; Turn left on 8th Street; Follow signs to The Jimmy Rodgers Museum in Highland Park. This stately 20-room Victorian mansion features unusual woodwork, handsome columns, mantels and stairway. It is one of fewer than six buildings left standing in Meridian after Gen. William Tecumseh Sherman's campaign in February 1864. 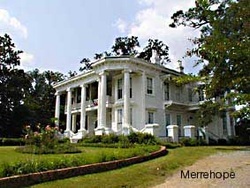 Merrehope was beautifully restored and furnished in 1968 by the Meridian Restorations Foundations, Inc. Hours: Monday-Saturday 10:00 a.m. until 4:00 p.m. Closed Sunday. Tour Prices: $5. Location: 905 Martin Luther King, Jr. Drive, Meridian, MS.
Jimmie Rodgers, The Father of Country Music, also known as "The Singing Brakeman" was born and reared in the Meridian area. The museum contains the original guitar of Jimmie Rodgers and other memorabilia of his life and career, as well as railroad equipment from the steam engine era. Open Tuesday, Wednesday and Thursday 10 a.m.-4 p.m. Tours can be arranged by appointment by calling 601-485-1808, 601-917-4344 or Lauderdale County Tourism at 601-482-8001. Admission: $5 adults, children under 10 free. Directions: From I-20/59 take the 22nd Avenue exit to downtown Meridian. Turn left on 8th Street and follow the signs located in Highland Park near the Carousel, 19th Street and 41st Avenue. The original store that sits next to the 1895 building was built in 1869 as a trading post for the settlers and Choctaw Indians. The gristmill is still in operation in the original building grinding corn into cornmeal. When the 1895 store was built, it also held the medical office of Dr. Billy Anderson, a country doctor. Many of the original fixtures are still in place. Upon entering the front door, you get to check out the 1890's street-vendor peanut roaster that was restored and is used daily. As you move to the back of the store, they have a wonderful player-piano collection of the late owner Leslie Hagwood. There is a silent-movie nickelodeon that came from the Grand Opera House in Meridian. It was purchased in the 1960s and had more than $65,000 put into its restoration and preservation. 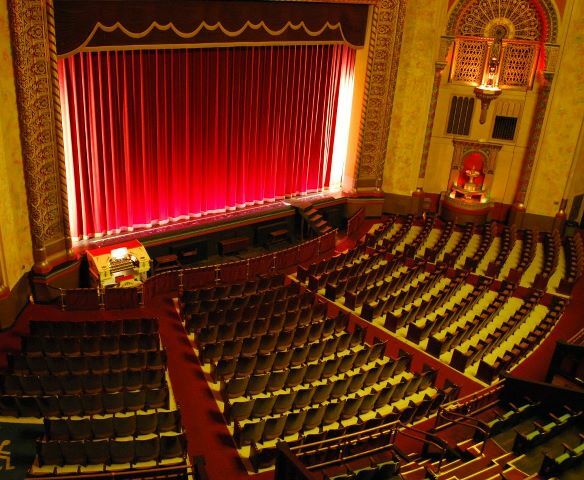 Prior to Mr. Hagwood's death, he offered it to the Riley Foundation, who purchased it and placed it in the opera house in Meridian after the building was restored. There is also a barroom piano known as the Egyptian, built by Wurlitzer in 1912. It features stained glass and a hand-carved cabinet. There were only two Egyptians built, and one was burned in the Cliff House Hotel in San Francisco in 1936. The other pianos on display include a home-model player with a built-in turntable and a Reproduco, which is a piano and pipe-organ combination. Behind the deli case you’ll find the cheese cutter used to slice the red-rind hoop cheese that has been made in the same area since 1898. The display cases are original, from the store buildings or other old stores in Mississippi. Back in the 1920s, there was a marble backbar and soda fountain. 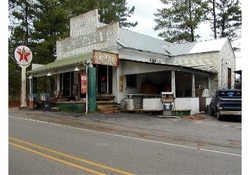 The store has been seen in commercials and featured in television specials about the gristmill. A national New York show, "Collectible FX," did a live show from the store. Hours of operation are 6 am to 7pm Monday through Saturday and 8am to 5pm Sunday. Directions to the store from I20-I59, Meridian, MS: Take Hwy 19 south approximately 7 miles, watch for state highway sign for right turn to Causeyville, follow signs for about 5 miles. The Mississippi State University Riley Center for Education and Performing Arts, in Meridian, Mississippi, is a vibrant hub for education, the arts, and conferences. At the core of the center is an 1889 fully restored Grand Opera House theater that presents over 25 nationally touring performing arts events a year, while also serving as a unique site for conference groups to enjoy keynote speakers, awards ceremonies, or private entertainment. The MSU Riley Center is comprised of two adjoining historical buildings in downtown Meridian; the Grand Opera House, which serves as a performing arts venue, and the old Marks Rothenberg department store, which provides state-of-the-art conference space. 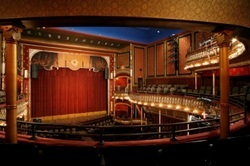 The Grand Opera House of Mississippi, nicknamed by Meridianites as “The Lady” for its composite portrait of a flowered lady above the center stage, was built by brothers I. Marks and Levi Rothenberg. It was originally conceived as a swanky hotel to adjoin the new top-dollar mercantile store when construction began in 1889. 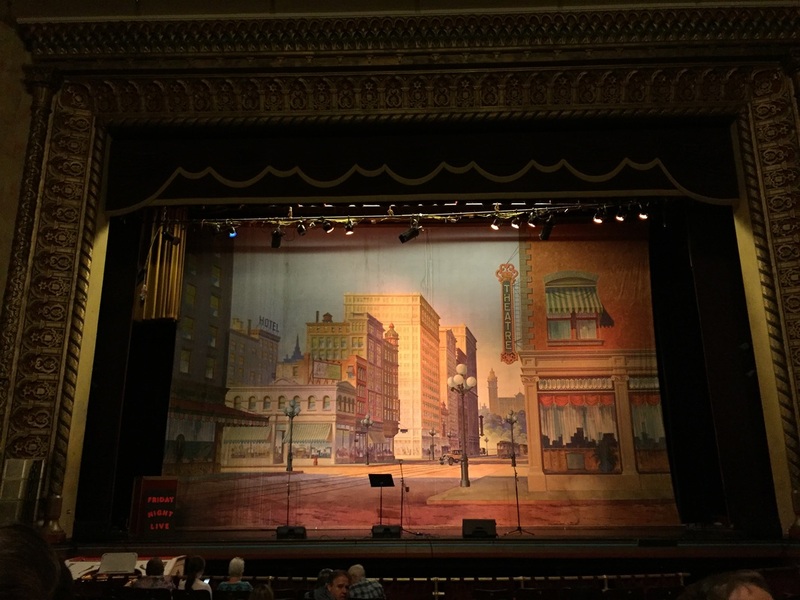 The structure took up almost an entire city block; in the midst of construction, the brothers decided to revamp the project as a performance theatre and cultural attraction for the booming railroad city. Marks and Rothenberg brought in the finest of theatre designers, J.B. McElfatrick, to complete the construction design and masterfully craft the hotel’s structure into a first-class opera house. The Opera House stayed in operation from 1890 to 1927 bringing to the community popular touring performances, including vaudeville shows, minstrels, and eventually film. 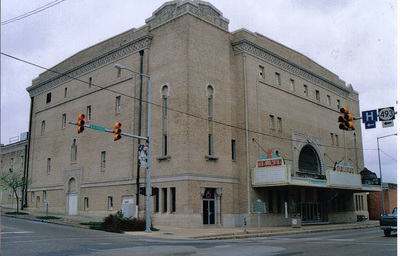 In 2006, the new MSU Riley Center for Education and Performing Arts opened the doors of a completely renovated historic theater with a capacity of approximately 900; over 30,000 square feet of meeting and convention space which accommodates educational functions, multiday conventions, and social events for crowds of 20 to 1000.